In 1967, more than 1,500 students walked through the doors of Pierce College sites with a special goal in mind: to further their education inside their own community. Then called Clover Park Community College, students attended classes in a variety of locations throughout Pierce County. The college held its first graduation ceremony on June 7, 1968. Seven students earned their associate degrees, and more than 200 completed the college’s Adult High School program that year. In addition to attending classes in a former grocery store location (affectionately referred to as Albertsons U), students also took classes at local military bases and Clover Park High School. Adult education classes were also held in local high schools throughout Pierce County. 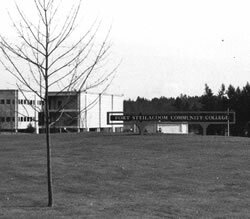 After a successful first year, the first order of business was to change the name to Fort Steilacoom Community College. A permanent campus was established on 146 acres overlooking Fort Steilacoom Park and Lake Waughop. As construction commenced on the college’s permanent buildings, the first classes were held in portables. The college celebrated an official groundbreaking for the Cascade building, its first permanent structure, in 1972. The Music/Fine Arts/Early Childhood Education wing opened in 1977. The college’s extension sites welcomed students throughout the 1970s and 80s, including Buckley’s Rainier School, as well as Western State Hospital, Cedar Creek Correction Center, McNeil Island Correction Center, and a small site in Puyallup. In 1986, as the college continued growing beyond the boundaries of its Lakewood campus, the board of trustees made the decision to change the name from Fort Steilacoom Community College to Pierce College. That same year, the college received national recognition for its program at McNeil Island when the National Institute of Corrections included the college in the nation’s top 5 literacy programs for inmates. In 1987, the college began focusing on expansion and growth of the Puyallup site. The college purchased 123 acres near South Hill, and the new campus’ first permanent building, the Gaspard Education Center, was dedicated in 1990. The campus continued to expand, and in 1996 the Brouillet Library Science building opened. Pierce College Puyallup was recognized by the State Board for Community and Technical Colleges in 1999 as the state’s 34th community college and the second college in Pierce College District 11. Both campuses continued growing in programs and enrollment throughout the 1990s. In 1994, the Pierce College Foundation was revived and hosted its first golf tournament, which has turned into a signature fundraiser supporting student scholarships. The Fort Steilacoom campus enjoyed renewed growth when the Sunrise building was constructed in 1998. The Sunrise building featured classrooms and a computer lab, and was the first new building on campus in more than 20 years. It was quickly followed by the dedication of the Olympic building in 2002. Pierce College Puyallup continued on its path of growth as well. The college dedicated its third building, the College Center building, in 2004. One year later, a second facility in Puyallup, the South Hill Park site, opened to offer additional continuing education workforce development, WorkFirst and PierceWorks opportunities. Each campus benefited greatly from the Pierce College Foundation’s 2004 Campaign for Childcare to raise funds for new childcare centers on both campuses. The Garnero Child Development Center in Puyallup and the Milgard Child Development Center in Fort Steilacoom opened in 2007. Later that year, the Fort Steilacoom campus opened the Health Education Center, providing classroom space for health and wellness education as well as a 16,000-square-foot gym and fitness facility. This impressive facility also serves as the home court for Raider athletics. The Puyallup campus opened its own Health Education Center similar to Fort Steilacoom’s, in 2008. The Arts and Allied Health Building, complete with a theatre, art gallery, recording studio and nursing skills and graphic labs, followed in 2010. Also, in 2010, the college opened the Rainier Science and Technology building, which remains the newest building on the Fort Steilacoom campus. The facility features classrooms, science and math labs, faculty offices, two winter gardens, and earned a gold rating based on Leadership in Energy and Environmental Design (LEED) standards. This eco-friendly building allows the building itself to be part of the college’s curriculum and increased focus on environmental sustainability. In 2013, the Pierce College Science Dome opened, becoming the only digital planetarium of its kind in the South Puget Sound region. The 58-seat planetarium is an immersive and interactive facility featuring a 38-foot dome-shaped screen that allows visitors to view the night sky from anywhere in the known universe, be immersed in breathtaking full-dome images and more. The facility hosts public shows, special events for visiting pre-K-12 school groups, college classes and more. Pierce College campuses continue to evolve, but the constant that remains unchanged is the institution’s commitment to student success. As a mission-driven college, students remain at the forefront of every decision made. The college continues to be recognized statewide and throughout the country as well. In 2012, Pierce College was selected as an Achieving the Dream college, a national network of more than 200 community colleges committed to student success reform. The organization allows colleges to share and develop best practices on how to help more community college students complete college. As a result of these efforts, Pierce College has been recognized with a number of awards and accolades for its work in improving graduation rates and the overall success of its students. In 2015, Pierce College was selected by CNN Money as Washington state’s most successful community college, based on the number of students who graduated or transferred to a four-year university. The following year, the Military Times ranked Pierce College as the Best Community College for Veterans in the state and No. 3 in the nation overall. The prestigious Aspen Institute College Excellence Program also named Pierce College to its list of the nation’s 150 best community colleges. The college continues to find ways to better meet the needs of students and, in 2015, announced the launch of its first-ever bachelor of applied science degree. As of 2017, students can now earn a Bachelor of Applied Science in Dental Hygiene, Homeland Security Emergency Management, and Teaching. Students also now have the option to stay in Pierce College’s first-ever residence hall, located near the Fort Steilacoom campus. The 63-bed facility is designed to provide a global learning community based on inclusiveness for local and international students, and to promote cross-cultural understanding and academic success. In 2017, as the college celebrates its 50th anniversary, it earned Achieving the Dream’s prestigious Leah Meyer Austin award for excellence. As one of the highest honors that a community college can receive, this was also the first time a West Coast community college earned the title. Pierce College is proud of the quality of our programs and the many ways we’ve helped students, families, businesses and our community grow. We look forward to helping even more students realize their possibilities in the years to come. This special year provides an opportunity for the college to reflect on our past, celebrate the present and move forward with a renewed dedication to our community and our students.